Recently, India’s Foreign Secretary Vijay Gokhale, the most senior bureaucrat in India’s foreign ministry, completed a visit to Russia. The visit shed light on the ongoing collaboration between the two countries and the opportunities and challenges for the relationship. The evolving situation in Afghanistan too was covered by the two leaders. The foreign secretary is reported to have also met Russian Deputy Foreign Minister Igor Morgulov for Foreign Office Consultations, where they “reviewed the implementation of the decisions of the 19th Annual Bilateral Summit” between Prime Minister Narendra Modi and President Vladimir Putin in 2018. The two officials also discussed the upcoming high-level meetings, including India’s participation at the Eastern Economic Forum. 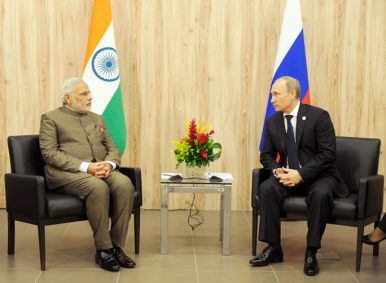 Putin has reportedly invited India to participate in the Forum, which is to take place in Vladivostok in September this year. Part of it has to do with perceptions on both sides. On India’s side, it can at times appear not to acknowledge the reality that Russia needs China far more than it needs India, and that its own diversification of partners in both the economic and security domains can also raise concerns in Moscow and complicate bilateral dealings. On Russia’s side, there is at times not enough of an appreciation for India’s strategic considerations, including its sensitivities toward China, as well as an acknowledgement that some of Moscow’s foreign policy activities can cause headaches in New Delhi. But developments have also accelerated these perceptions as well. Russia’s adventurism abroad, including in Ukraine, China’s rise and its increasing convergence with Russia as it does so, rising U.S. competition with both Beijing and Moscow as it has gradually warmed to New Delhi, and upped conversation on the Indo-Pacific and the divergent approaches by India and Russia have all contributed to this.